Warmth, security, and value. 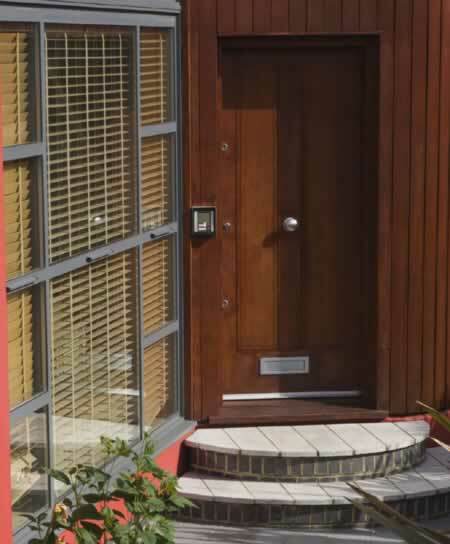 That's what this wood door and entry provides to the homeowner who is willing to spend money on quality. Wood is durable and offers traditional allure with this center knob that recalls fine European design. Keypad entry locks and deadbolts mean you and your loved ones are safe and sound. You never have to worry about losing your keys or having them stolen. To create exceptional curb appeal, coordinate your wooden door with handsome tile work and greenery. This homeowner takes advantage of the wide, strong panels and mullions in the door to complement the narrow tiles and slatted veneer in the siding. An extra tough saddle creates lasting value.The center knob provides functionality while it carries the brushed-metal treatment of the mailbox, hardware, and doorlock. Silver trim on the windows echoes the hardware and complements the dark stain.